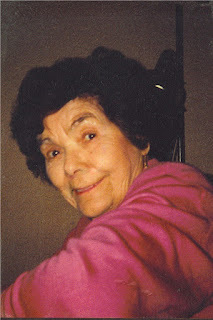 My late Grandmother once said that although she was in her eighties, she still felt the same inside as she did when she was 18. I related this remark to my older sister the other day who said that was true for her too and asked if I could say the same for myself. But even though I'm only half the age my Gran was when she said it, for me, the answer is definitely no and thank God for that. When I was 18 I felt like I knew it all. Like I was embarking on the big adventure of life without need to listen to the advice of anyone else because, of course, they were old and what did they know anyway? Although in the still of the night, alone, that wasn't what I really felt. I would never have admitted it at the time, but I was unsure, untried, untested, not even knowing who I really was inside, definitely not knowing anything worth knowing about the world. But ignorance is the beauty of youth. If we really had an idea in our heads of what was in store, we might just pull the covers over our heads and never get up again. The sheer number and variety of events, good and bad, that happen to us over the course of even half a lifetime would be too overwhelming. At 18, I hadn't a thought in my head of what it might to like to have real responsibility, of worrying about someone else instead of just yourself, of making a marriage work through its inevitable highs and lows. The thought of dealing with the estate of a newly-deceased parent, would be terrifying wondering as you combed through the accumulated belongings and papers of a whole life, if you ever really knew them. Although many women know this already by the time they're 18, for me, the thought of motherhood wasn't even a flash of consideration. How I would deal with two children who had special needs? If I'd thought of that one, I probably would have approached the whole concept of motherhood with a lot more respect. As I think back to myself at 18, I cringe at the thought of how much I thought I knew, compared to how little was actually going on in my head at the time. And yet, despite that, when you are 18, every little event is a great drama, you, the star of your own life. But now, at 42, I realise that the progression through life, gathering experiences, gaining and losing family members making good decisions and huge mistakes, is what makes you who you really are - that person you couldn't have possibly known about when you were 18. Times can be great, times can be tough but it's the grace with which you handle both those things that matters. Sometimes I succeed in this and sometimes I fail but in everything, I learn that I didn't know everything when I was 18 and I certainly don't now. Grace is something else I didn't have much of at 18. I actually envy my Grandmother feeling she hadn't changed over the course of a lifetime but I don't think she was right. The wisdom she had at 87 comes as the product of experience. I don't have the energy, the body or the enthusiasm I had then. I was, at 18, what a new adult should be - a blank slate on which to chalk the happenings of a life to come. But, for me, what has replaced youth and fearlessness is so much more fulfilling that I don't envy my younger self at all.